This website was built and designed to provide information specific to the sport of whitewater rafting to serve as an educational and informational resource for guests, guides and the general whitewater rafting community. Portions of this website were excerpted from California Whitewater, a whitewater rafting guidebook written by Jim Cassady and Fryar Calhoun. Other information was excerpted from The Best Whitewater in California by Lars Holbeck and Chuck Stanley. 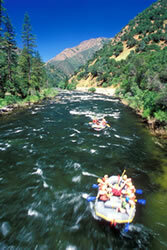 Visit the About the Book page to find out how to order either one of these California Whitewater Rafting Guidebooks. Commercial outfitters have been operating on the Merced for years. If the experience and skills required to run this river are above your capabilities, consider planning your rafting adventure with a commercial whitewater rafting outfitter. The details in this resource are intended to be used by experienced whitewater boaters, and can be used to plan a whitewater rafting trip on the Merced River.